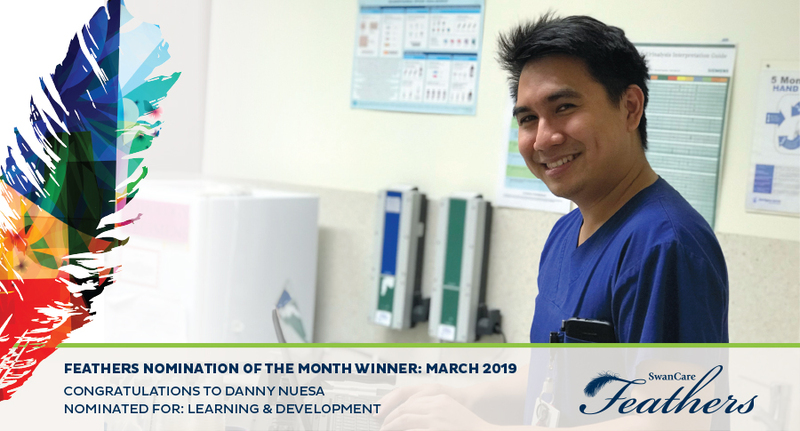 Congratulations to Danny Nuesa, Registered Nurse at Kingia for taking out the top Feathers Award for March in Learning and Development! Very few Aged Care providers offer this tracheostomy care to residents, and we’re so privileged that Danny took the opportunity to share his knowledge and experience. Thank you Danny! SwanCare’s Feathers nominations provide a small window into the deeply caring hearts of every SwanCare team member. In particular, this month, our Feathers nominations are characterised by deep compassion for our residents, expressed by personal efforts to brighten their day. From Tanya Rose who stays back because, she says, “I love my residents,” to Anita who makes an extra effort to find friendship in all, we have many special staff who are worthy of recognition. This month we recognise Korina for her compassion in spending quality time with our residents, offering friendship and love. “Korina takes our residents, Mrs Curtis and Mrs Raphael, with her on tea breaks so they can sit in the garden and enjoy the fish pond. She looks after them from afar, making sure they’re happy and in doing so, she prevents the ladies from becoming agitated or wandering about. She really makes their days brighter.” Thank you so much Korina – it’s moments likes these that make all the difference. This month, Dianne has taken out the Innovation Award for her initiative in highlighting the specific continence needs of our residents in order to improve continence management. “Dianne is one of our wonderful night staff up here on K2. More than once, Dianne has made a special point of approaching me to discuss continence issues that happen at night. Due to her feedback, I’ve been better able to co-ordinate the correct continence management plan for our residents. Without her feedback, I wouldn’t know exactly what works and what doesn't for each resident. Thank you Dianne. Your help is amazing!” Well done Dianne! Our SwanCare team members support one another – no matter what their role, department, or area of responsibility. This month, Zoran Pusaric has taken out the Teamwork nomination for years of dutiful, reliable and high-quality maintenance support. As Zoran’s nomination read, “I would like to acknowledge Zoran for his consistent excellent support. I have called upon Zoran several times over the past month. He answers immediately and is always ready to help. He is consistent and professional, and he will be there to complete the work at a high quality when we need him. It’s about time I acknowledged his valuable team work and willingness to assist the IT department over the years. Thanks for being a great team player throughout the years.” Thank you Zoran for your highly valued work which keeps SwanCare running so smoothly. Safety is everybody’s priority at SwanCare. This was clearly illustrated with Enock’s deep concern when he saw two aggressive teenagers loitering around our facilities. “Enock noticed two teenagers who appeared to be aggressive and abusing people who got in their way. With residents and family members outside, Enock asked the teenagers to leave as he was deeply concerned for the residents and families nearby. I commend Mr Badu for his dedication, care and courage for our residents.” Thank you for always looking out for our residents and acting swiftly to address the situation Enock. This month, we offer a heart-felt thank you to Marissa for her generosity and goodwill. As the person nominating Marissa wrote, “I love that Marissa sometimes brings her mother in, on her days off, so she can spend time with the residents and be reunited with her old friend Hazel. Our residents see Marissa as the caring daughter she is - not simply their nurse. During these visits, Marissa relaxes with the residents and their families. Her act of kindness adds another dimension which is quite unique and special.” Thank you, Marissa, for your personal efforts to connect on a deep level with our residents. Like many of our team members, Jovy regularly appears in our monthly Feathers nominations – and it’s no surprise why. This month, we thank Jovy for her highly effective leadership style which empowers her staff to consistently exceed their own expectations. “Jovy is a strict manager who is focused on delivering the highest standard of care to our residents. Her leadership style is about making sure everyone improves at their job. When someone does good work, she acknowledges and praises them. She also recognises all the good things they’ve done, even little things. She always does this and as an Assistant in Nursing, I feel very valued.” Thank you Jovy for encouraging our team members to be the best they can. A true superstar this month, Danny Nuesa has not only won the top Feathers Award for March, but has also taken out the top nomination for Leadership. Danny is being recognised for his managerial capabilities and resourcefulness in coping with a broken burlodge. “Danny quickly re-arranged staff and sourced another microwave, ensuring our residents would have dinner on time. Danny has and practiced his management skills to address a range of issues. He now checks the burlodge as part of his daily routine to prevent this issue from happening in the future,” read the nomination. Congratulations Danny for being recognised for both leadership and innovation this month – we are incredibly grateful for all you contribute. This month, we extend our deepest gratitude to Eric Almen and Amal Zainuden, who swiftly assisted a team member during a difficult time. A resident in Waminda had just passed away, and with two registered nurses having just completed their shift earlier, a team member required assistance to verify the resident’s passing. “Eric Almen picked up the phone and reassured me he would come from Kingia with another RN. To my relief and gratitude, Eric and Amal came immediately while I offered emotional support to our resident's family. Considering Eric and Amal had their own responsibilities, I appreciated that they acted straight away, enabling me to organise the other necessities. The bereaved family was consoled by having things in place in a timely manner. Eric and Amal are worthy of emulation!” What a lovely nomination, thank you for your support during this difficult time Eric and Amal. Although there can only be one winner for each category, we had many notable nominees in March. Team nominations: Zoran Pusaric and Jake Francis (Maintenance) for always answering every call with goodwill and a positive attitude. Eric Almen and Amal Zainuden (RNs) for their dependability during an hour of need. Flordelizia Belarmino, Safiatu Greywood, Michael Bermejo and Kushum Bhandari (AINs) for stepping up to cover an under-staff tea round. Congratulations to all of our Feathers nominees!